Designed for several fabric and textile printing applications such as: POP signage, trade show graphics, museum fine art prints, banners, flags, fabrics for custom clothing, fabrics for interior design and much more. 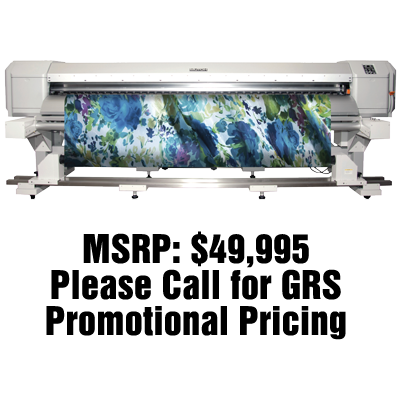 Mutoh's ValueJet 2638 - 104" grand format printer has a staggered dual-head design for faster production speeds to create supper wide images with unmatched quality. With print speeds of 1,168 sf/hr and print widths that are over eight feet wide, the VJ2638 not only saves you time and money but it also capable of producing high quality, super wide images for a number of popular applications like; designs and patterns for trade show graphics, flags, banners, custom clothing, interior design, point of purchase displays and more. And with Mutoh's Smart Printing Technology like; Intelligent Interweave (i2) print technique that virtually eliminates banding and the ValueJet Status Monitor (VSM) for remote printer monitoring from your smart phone the VJ2638 is the best choice for today's production minded print professionals.